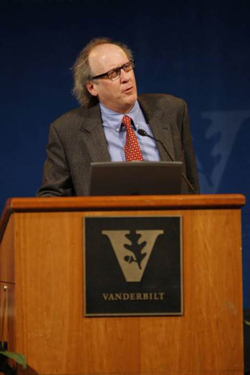 A Vanderbilt University professor will tell the whole truth about lying at the next Thinking Out of the (Lunch) Box: Conversations with a Philosophical Flavor talk at the Nashville Public Library, located at 615 Church St.
“I will discuss various ways that the phenomena of lying and deception in social interaction fit into and emerge from my research and teaching on business ethics, the psychology of negotiation and public policy,” said Bruce Barry, the Brownlee O. Currey Jr. Professor of Management at Vanderbilt’s Owen Graduate School of Management. The Thinking Out of the (Lunch) Box: Conversations With a Philosophical Flavor session begins at 11:30 a.m. Wednesday, March 9, with lunch. Barry begins his talk, “Lie Me a River: Deception in Modern Life,” at noon. A limited number of lunches will be provided on a first-come, first-served basis. Thinking Out of the (Lunch) Box: Conversations With a Philosophical Flavor is hosted by David Wood, the W. Alton Jones Professor of Philosophy at Vanderbilt and founder of the series. It is sponsored by Friends of the Nashville Public Library, with additional funding provided by the Kendall Berry Charitable Trust. No reservations are needed. The lunch and talk are free and open to the public, but a $5 donation is suggested to help defray costs.